Former Alabama Crimson Tide and current Atlanta Falcons wide receiver Julio Jones had a historic day in his career despite a bad outing from his team. In the Atlanta Falcons’ 28-16 loss at the Cleveland Browns, Jones became the fastest player ever in NFL history to account for 10,000 career receiving yards, reaching the milestone in just 104 games. He shattered former Detroit Lions receiver Calvin Johnson’s record of reaching 10,000 yards in 115 games. Former Rams receiver Torry Holt and Pittsburgh’s Antonio Brown got to the 10,000-yard mark in 116 games. 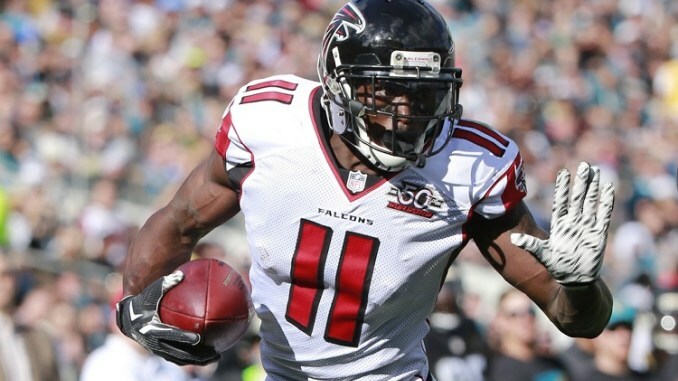 Since being drafted sixth overall in the 2011 NFL Draft by the Falcons, Jones has been one of the most electrifying, dynamic, and physically dominant receivers in the league. In 104 games in his career, Jones has accounted for 652 receptions, 10,094 yards, averaged 15.5 yards per reception, 45 touchdowns, and averaged 97.1 yards per game. Jones has been the leading receiver for the Falcons every year since 2014. Jones got to the 10,000-career receiving mark from a 30-yard pass from quarterback Matt Ryan in the second quarter. In the game, Jones was able to account for his second receiving touchdown of the season from a designed screen where Jones fought through a Browns defense that read the play from the beginning. This has been a common trend for the Falcons this season and last season, as they’re having problems giving Jones the touchdowns he deserves in the end zone. He continues to be an excellent receiver down the stretch for the Falcons in terms of accounting for many yards and winning one-on-one (or double coverage) matchups. So far this season, Jones has 67 catches for 1,040 yards, 2 touchdowns, and an average of 15.5 yards per reception. This is the sixth season of his 8 years in the NFL where he has accounted for a 1,000-yard reception season. The only years where he didn’t account for 1,000 yards was when in his rookie season in 2011 and in 2013 where he only played in five games because of a fractured foot. Julio Jones also moved to 47th place in the NFL’s career receiving yards list ahead of former Denver Broncos and Baltimore Ravens TE Shannon Sharpe (10,060 yards). Jones will continue to move up the list as only trails former Green Bay Packers WR Donald Driver by 43 yards. Julio’s young age at 29 years old and his impact with the Atlanta Falcons can continue to make more strides as an all-time great receiver.